Get rid of embarrassing scars on your skin with the Mederma Skin Care Gel Scar Treatment. This skin cream penetrates deep into the skin to help reduce the appearance of scars. The non-greasy formula works to effectively fade scars from surgery, injury, burns and accidents. Made with botanical extracts, this Mederma Skin Care Gel Scar Treatment can even fade away old acne scars. Normally, fade cream can contain lots of fillers and skin-irritating ingredients. Mederma Skin Care Gel blends Cepalin (onion extract), hyaluronic acid (hydrating agent), and Centella asiatica (leaf extract) for natural results. Apply and gently rub into the scar once a day for 8 weeks on new scars, and once a day for 3-6 months on existing scars. 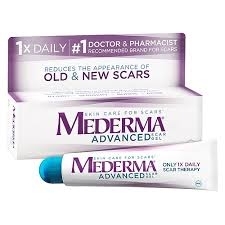 Apply Mederma Scar Gel as soon as your wound has closed. Store at room temperature. Water (Purified), Peg-4, Aloe Barbadensis Leaf Juice, Allium Cepa (Onion) Bulb Extract, Xanthan Gum, Allantoin, Methylparaben, Sorbic Acid, Fragrance.